Essensity Colour & Repair by Schwarzkopf is just amazing. I am one of those ladies that changes the color of my hair often, flat iron it daily and blow dry it often even though I know it causes a lot of damage to my hair. I guess that's one of the "perks," we get when trying to look good. I have a really sensitive scalp and I've always had a hard time when it comes to finding great hair products that actually works on my hair and leaves me without irritation. So when I had the opportunity to review and try out the entire line from the Essensity Colour & Repair line, I didn't see any harm in giving it a try. The items I received were the Shampoo, Conditioner, Protection Serum and intense mask. I was and still am very impressed with the shampoo and conditioner. It not only feels amazing on my hair, but it leaves my hair feeling so healthy after and I love the smell of it. I've even had friends and family ask what is in my hair. With the colour & repair intense mask, I loved what it did to my hair as well. I just had to get the hang of what amount to put on my hair. When I first used it, it left my hair feeling a bit greasy, but now that I have been using it for almost a month and using it on a regular basis, I find it leaves my hair feeling less damaged and very healthy. Lastly, the colour & repair intense protection serum. What a difference it made in my hair, it not only left my hair feeling soft, but it also gave my hair a shine like I've never had before. I'm just loving this entire line from start to finish. My hair has never felt so healthier, soft and beautiful. I've even let my hair stylist know about this line and I'm hoping she starts using it because it's definitely worth using. 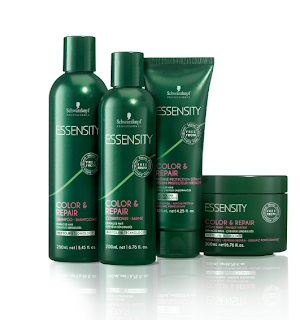 The Essensity Colour & Repair Line by Schwarzkopf is now available in salons as of January 2014. Be sure to check out www.salonfinder.ca to find out if it's near you! Disclosure: All opinions are my own. I received the Essensity Colour & Repair line at no cost for the purpose of this review. No other compensation was received.